Modern living under thatch has changed in the last 10 to 15 years, with the introduction of modern central heating, double/secondary glazing, power showers and more home owners wanting fully vaulted ceilings. In addition, the requirements and associated recommendations from Building Control and insurance companies see the requirement for fire barriers and increased levels of insulation to be installed within the roof structure. All these areas can have an effect on the performance of thatched buildings, therefore all components of the roof structure need to be built into U-Value calculations/reports. For comparison, the standard in Part L of the Building Regulations (2010) for replacement roof insulation at rafter level is 0.18 W/m²K. 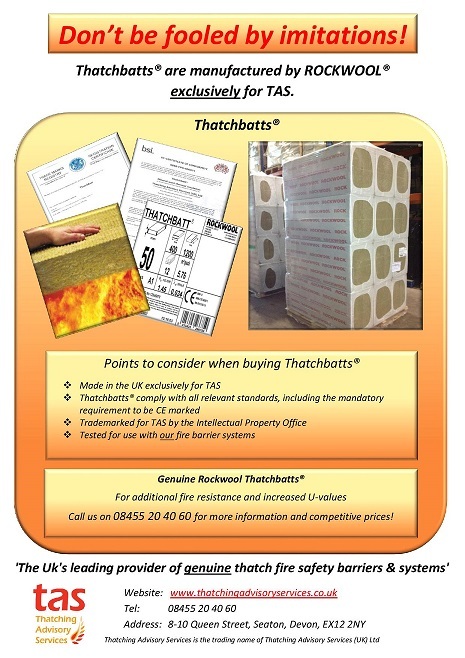 A suitable insulation product to help achieve a U-Value of 0.18 would be Thatchbatts® as they are non-combustible, high density slabs which also offer additional protection in terms of fire resistance. It is widely accepted in the construction industry that in addition to sufficient levels of insulation, vapour control layers are required to control vapour and reduce the risk of condensation. A correctly fitted vapour check will also play an important part in the way the building continues to perform in the long term. Bespoke U-Value & Condensation Risk Analysis reports can be generated for thatched roofs and will take into account the design and construction, type of materials used and location within the country. See the Thatching Advisory Services website for further information and product details. Thatching Advisory Services (TAS) recently launched it’s new website. The new site contains the latest information on fire protection as well as comprehensive advice on buying, owning and maintaining thatched properties. There is a new section devoted to new builds and extensions which includes detailed information on roof construction and the latest building regulations. There is comprehensive information on all our products and systems and a new facility to buy the products via our online shop. 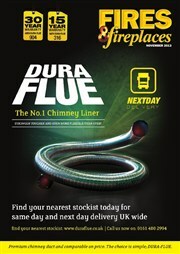 Have a look around the site and feel free to contact us with feedback or if you have any further questions or queries. 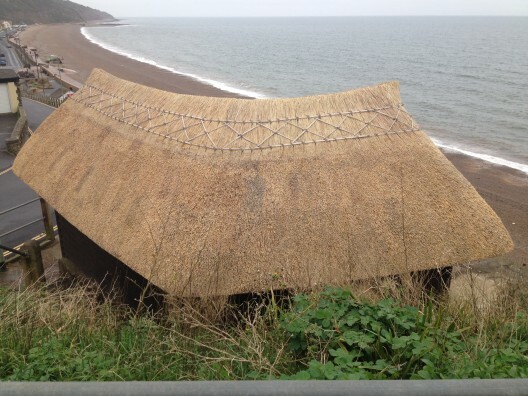 Dorset Model – Technical guide to planning requirements for thatched properties. Thatch is enjoying a resurgence. Architects, builders and owners increasingly acknowledge the advantage of thatch insulation and aesthetic qualities. Recognising this increasing popularity the eight building control authorities throughout the county of Dorset reviewed current building controls for a thatched roof. Either protect the main structure of the building if a fire occurs. Or provide better protection for the roof members if a fire occurs. Require an acceptance to treat the thatch as sacrificial in a fire. Companies specialising in thatch roof insurance welcome the “Dorset Model” and recognise that it will reduce the premiums paid. Thatchbatt® The Real Thing!! from Thatching Advisory Services. TAS has recently embarked on a campaign to highlight the authenticity of one its products – Thatchbatts® and has sent out information highlighting the levels of testing and approvals that the product has gone through. In summary, when specifying a non-combustible insulation product for a thatched roof, this needs to been done on a like for like basis and therefore careful consideration should be given to the specification. 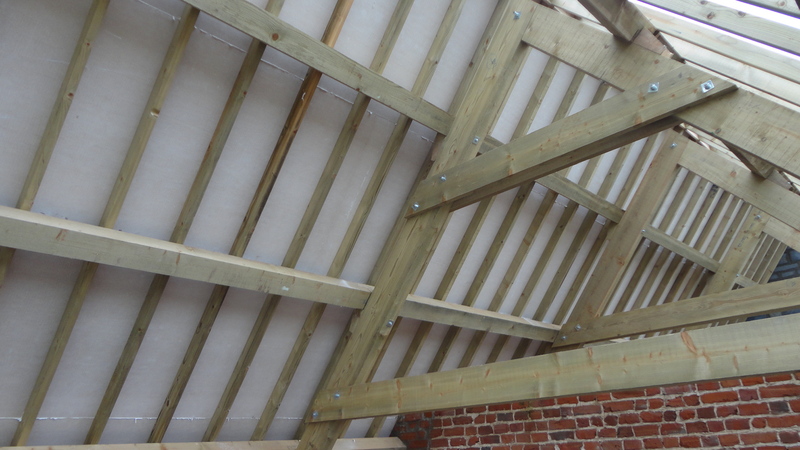 Thatchbatts® are a vital component of both the TAS-Thatch Firewall & TAS-Fireboard systems. For more information about Thatchbatts® or other Thatch Fire Barriers, please contact Thatching Advisory Services on 08455 20 40 60. Hetas and Thatching Advisory Services collaboration. Thatching Advisory Services collaborated with Hetas on an Editorial in The Technical column of Fires & fireplaces November 2013 Issue; to offer guidance on how to ensure chimneys installed in thatch comply with building regulations.